But that home is in crisis, and has been for two and a half years. The problems began in the fall of 2011, when news spread that the bookstore — beloved for its literary and artistic offerings, which often leans towards the obscure, esoteric, and DIY — was struggling to pay its $20,000/month rent. 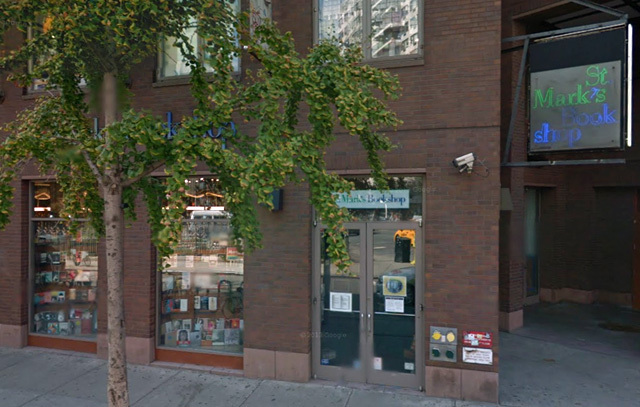 The bookstore approached its landlord, Cooper Union, asking for a $5,000 reduction, but the school refused. A petition was circulated, garnering more than 44,000 signatures, and Manhattan Borough President Scott Stringer stepped in to mediate. By the end of that year, St. Mark’s had a $5,000 monthly rent reduction and $7,500 in debt forgiven by the school. The bookstore, the literary community it represents, even Stringer, celebrated. “Every time we save a local bookstore we save a local community,” the borough president said at the time. The victory was short-lived: the rent reduction was temporary. As St. Mark’s co-owner Terry McCoy explained to me, “It was a one-year reduction, and then it went back to the original escalations in the lease.” Which means St. Mark’s was once again left with a rent it couldn’t pay and the task of finding a new home, as well as the money with which to acquire said home. A third scheme is currently in the works, but given the rocky history, Contant was reluctant to share details. He and McCoy have a lease in hand, for a city-owned space that’s smaller than their current home but seems “encouraging.” “There’s a lot of things up in the air, but nothing’s settled yet,” he said. Some St. Mark’s supporters are critical of Cooper Union’s part in St. Mark’s plight. “What is the role of these education institutions?” asked, John Oakes, co-founder of OR Books. “What is the role of these huge nonprofits, like Cooper Union or NYU? Part of the role is to be good community participants, members of the community.” Oakes said he found it “doubly appalling” that the bookshop’s landlord is a college. But Margarita Shalina, St. Mark’s small press buyer and events coordinator, stressed that Cooper had been “gentle and patient” in its dealings with the store over the past few years. Presuming they do sign that lease on that promising new East Village location, Contant and McCoy still need to find a way to raise enough money to make the move. The shop held an online auction of rare books in December, but “that seemed to be a bust,” Contant said, making barely a dent in the “couple hundred thousand dollars” they need. To that end, they’ll be launching an Indiegogo campaign soon — not the first time they’ve turned to crowdfunding — and have also formed a Friends of St. Mark’s Bookshop Committee to brainstorm and implement other ideas. Spearheaded by Erica Hunt, a consultant who generally works with nonprofits (which St. Mark’s is not, although it’s obviously struggling to be profitable), the committee held its first meeting two weekends ago.